My name is Michelle Bumatay and I am an Assistant Professor of French specializing in sub-Saharan African and diasporic literature and cultural production. Specifically, my research focuses on bandes dessinées (French-language graphic novels known in French as BD) by cartoonists from Africa and Europe and investigates the verbal-visual strategies at work in such bandes dessinées. Accordingly, this blog is primarily dedicated to the review of bandes dessinées—both old and new— so as to participate in larger discussions of such texts and in hopes of bringing these texts to a larger audience. Forthcoming: “African Bande Dessinée Festivals & Competitions: Participation, Patronage, and Performance,” in Research in African Literatures. vol. 50, no. 2, 2019. Forthcoming: “Picturing the (Silent) History of Immigration in France and in French Bandes Dessinées,” in Immigrants and Comics: Graphic Spaces of Remembrance, Transaction, and Mimesis, ed. Nhora Serrano, Routledge, 2019. Invited Round Table Organizer, “Decolonising the Arts: Museums & Restitution,” at Kent State University, Kent, Ohio, Jan. 25, 2019. Bumatay, Michelle, and Joseph L. Underwood. “Focus: Ibrahima Dieye.” The View From Here: Contemporary Perspectives From Senegal, edited by Joseph L. Underwood, Joseph L. Underwood and the Kent State School of Art Collection & Galleries, 2018, 58-60. “Focus: Camara Guèye.” The View From Here: Contemporary Perspectives From Senegal, edited by Joseph L. Underwood, Joseph L. Underwood and the Kent State School of Art Collection & Galleries, 2018, 49-53. “Review of La fabrique des classiques africains: Écrivains d’Afrique subsaharienne francophone (1960-2012) by Claire Ducournau,” H-France Review. vol. 18, no. 94, 2018. 2017 Associated Colleges of the Midwest (ACM) Mellon Faculty Fellows Meeting, Chicago, Illinois, Jan. 27-28, 2017. 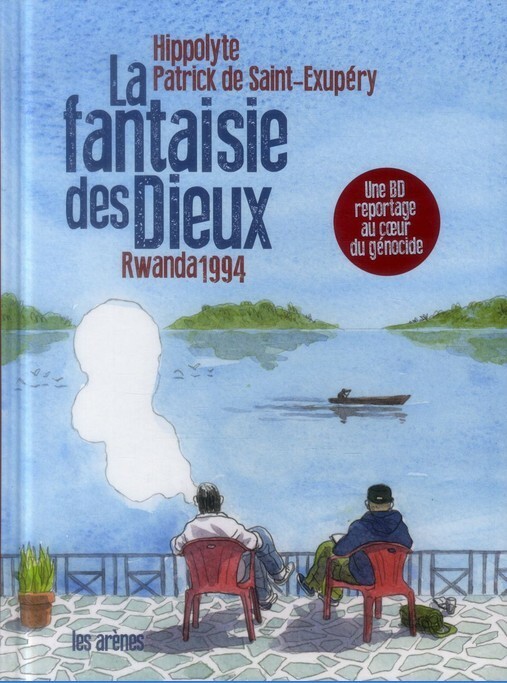 For my initial post, I chose to review a recently published non-fiction BD entitled La Fantaisie des Dieux: Rwanda 1994 by Patrick de Saint-Exupéry and Hippolyte for multiple reasons. First, I thought it fitting to begin with a BD published in the spring of 2014 so as to coincide with the 20th anniversary of the 1994 Rwandan genocide as I have been working on representations of the genocide in BD for quite some time and I find it pertinent and telling that this particular BD serves as a kind of commemoration of the genocide. Second, the representation of the past and its influence on the present, which are so pronounced in this particular BD, are arguably at the heart of many contemporary BD. Third, whereas the trend for francophone BD is towards auteur texts in which the author is responsible for both the images and the text, La fantaisie des Dieux: Rwandan 1994, as a collaborative effort between de Saint-Exupéry and Hippolyte, allows me to single out various verbal and visual components whose marriage is foundational for understanding the text as a whole. And lastly, I chose La Fantaisie des Dieux: Rwanda 1994 precisely because of its contemporaneity as it provides interesting insight into the current state of BD production, dissemination, and consumption in the francophone context. Feel free to use the form below to contact me with questions and comments.